NASHVILLE, TN--(Marketwired - December 12, 2016) - INFINITI today announced that its new 3.0-liter twin-turbo V6 engine has been named to Wards "10 Best Engines" list for 2017. The advanced VR-series engine, which was tested by the WardsAuto editors as offered in the INFINITI Q50 Red Sport 400, is available across the range of Q50 sports sedan models, as well as the recently introduced, all-new INFINITI Q60 sports coupe. The 3.0t engine is available in two configurations -- 300 horsepower with 295 lb-ft torque, and in a high-performance option delivering 400 horsepower and 350 lb-ft torque. "INFINITI customers have a passion for driving and offering the new 3.0-liter twin-turbo V6 engine helps make sure we meet their high expectations," said Roland Krueger, president, INFINITI Motor Company, Ltd. "INFINITI is honored to be named to this prestigious list of the most technically significant powertrains in the world by the experts at WardsAuto. We are on track for record global sales in 2016 and the exceptional engineering and performance of our engines have certainly played an important role in this success." 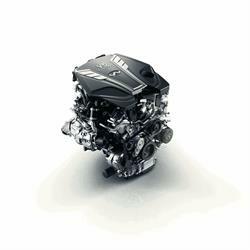 The new INFINITI powerplant was chosen from a field of 40 new or significantly improved powertrains, alongside Wards 10 Best 2016 winners, in vehicles with a base price below $62,000 and available in the U.S. This is the 23rd year that Wards has assembled the "10 Best Engines" list. "The Q50's twin-turbo V6 puts INFINITI neck-and-neck with its German competitors," said Dave Zoia, WardsAuto editorial director. "Silky smooth, quiet when you want it to be and capable of delivering some pretty respectable fuel economy numbers. We're thinking the new VR engine just might be a dynasty in the making." The new VR-series 3.0-liter V6 twin-turbo engine adopts a series of innovative technologies to deliver an engaging driving experience, including a new direct-injection gasoline (DIG) fueling system. The engine also features lightweight aluminum construction and low mechanical friction -- providing highly responsive and reliable performance. The VR-series power delivery is enhanced through a new twin-turbo system, which enables smooth and immediate response under acceleration with power available across the rev range. The VR-series V6 is the also the cleanest and most fuel-efficient engine of its type that INFINITI has ever offered, providing a 6.7 percent improvement in fuel economy versus the 3.7-liter V6 previously available in the Q50 and Q60. WardsAuto also recently selected the INFINITI Q50 sports sedan as one of "Wards 10 Best User Experiences (UX)" honorees. In its inaugural year, the UX awards are meant to highlight exceptionally advanced, intuitive and forward-thinking vehicle systems and interfaces designed to minimize distractions, prevent accidents and improve safety. The Q50 was chosen for its unique blend of driver assist and safety systems, advanced in-dash user interfaces and systems and INFINITI InTouch™ telematics. Specific safety and driver assist features highlighted include Cross Traffic Alert, Predictive Forward Collision Warning and Around View® Monitor with Moving Object Detection. INFINITI is in the middle of a major product offensive. The brand has been widely acclaimed for its daring design and innovative driver-assistance technologies. From the 2016 season, INFINITI is a technical partner of the Renault Sport Formula One team, contributing its expertise in hybrid performance.